This post is sponsored by Pacific Foods. All opinions are my own. 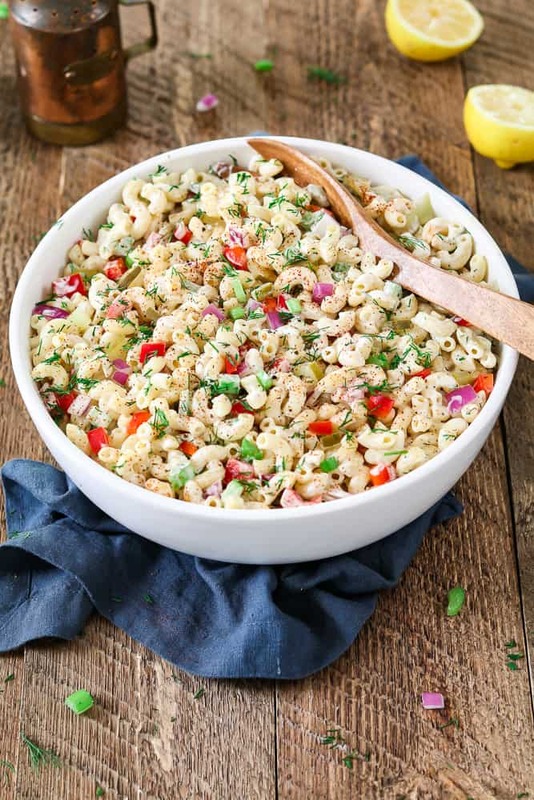 Creamy Vegan Macaroni Salad ~ a summertime essential! With a healthier twist, it’s mayo-free but still rich, creamy & full of classic flavor. 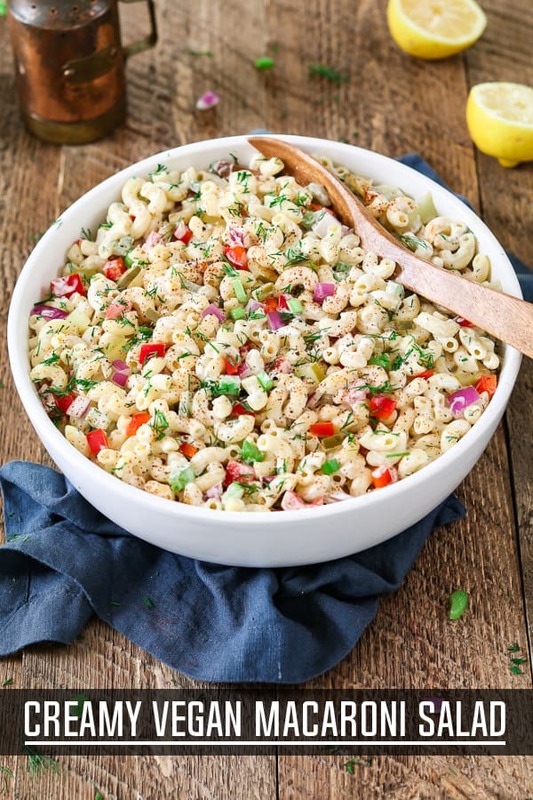 It’s just not summertime without a big bowl of Vegan Macaroni Salad on the table. Don’t you agree? It’s perfect for backyard barbecues, picnics, potlucks and beach days. It’s always the first to disappear, right next to the potato salad. It’s comforting, yet refreshing and cooling with its crisp veggies, al dente macaroni, and tangy-sweet dressing. The dressing is creamy and silky-smooth without any mayonnaise. Instead, I used non-dairy yogurt, raw cashews, and Pacific Foods Hemp Unsweetened Original Non-Dairy Beverage. The combination is magical! To give the dressing that classic tang and subtle sweetness, I added lemon juice, red wine vinegar, pickle juice, dijon mustard and agave syrup. I added a little fresh garlic, fresh cracked pepper and salt to finish the flavors. Then I blended it all up into a thick and creamy macaroni dressing. Pacific Foods is a trusted brand in our household and we have a variety of items in our pantry. They carry beans, seitan, steel-cut oats, sauces, purées, broths, stocks, soups and non-dairy beverages. Their products are shelf-stable, non-GMO and made with carefully sourced ingredients. The company’s prime focus is nourishment and they care about the ingredients going into their food and into our homes. I also like that their products are affordable and easy to find. 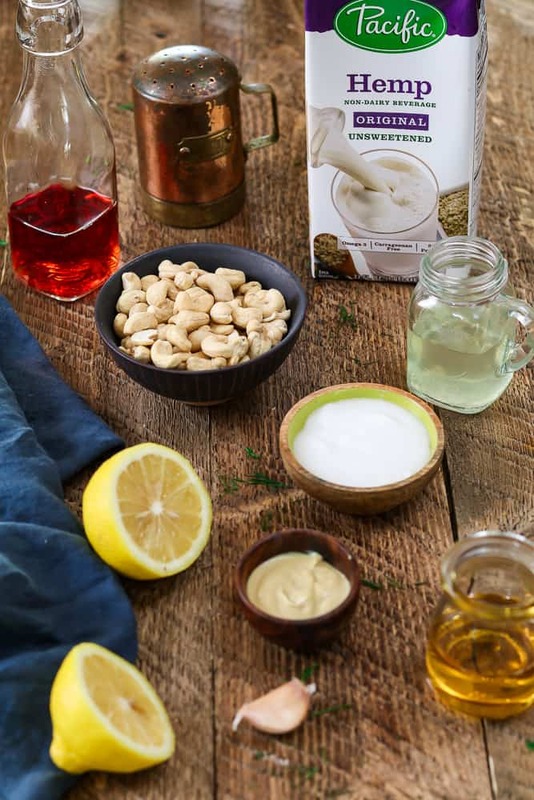 Their first product on the market was a Soy Non-Dairy Beverage, and since then, their non-dairy line has expanded to Almond, Coconut, Hazelnut, Cashew, Rice, Oat, and Hemp. So many delicious and nutritious choices! I love having a variety on hand for morning smoothies, cereal, coffee and for my serious cookie dunking skills. 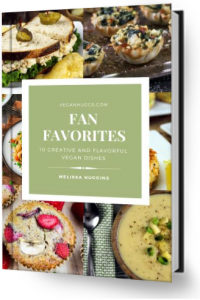 Plus, the various options are great for many of my sweet and savory recipes. 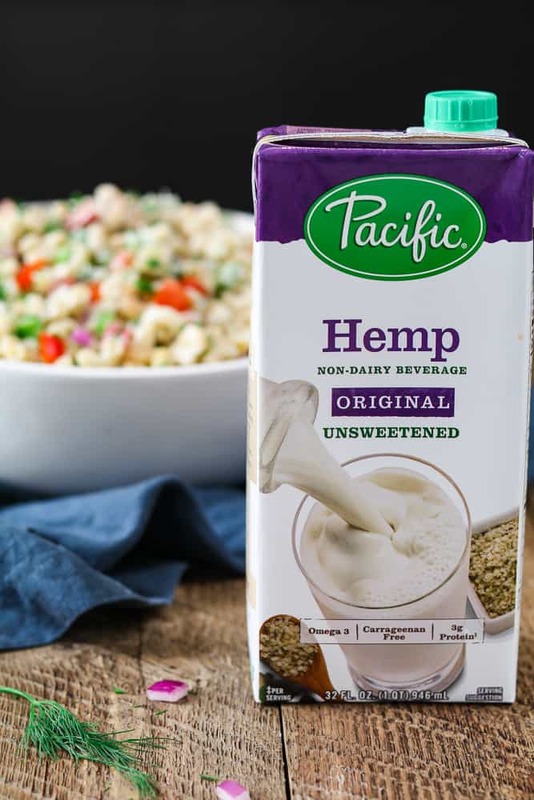 For this Vegan Macaroni Salad, I used their Hemp Unsweetened Original Non-Dairy Beverage. It has a subtle nutty flavor and it’s ultra creamy, which worked beautifully for the dressing. As far as nutrition goes, it’s loaded with all the Essential Amino Acids and it’s Protein-Rich. Plus, it’s a great source of Omega-3 ALA, Calcium and Vitamin D. So not only is it tasty, it’s good for you, too! After you chop your veggies and make the macaroni dressing, it’s smooth sailing from there. Just cook the elbow macaroni pasta al dente and according to package directions. Now rinse with cool water. and drain well. When cooled, place in a large bowl. Drizzle and toss with olive oil (*omit to keep oil-free). Now add all the chopped veggies, pickles and chopped dill to the same bowl. Add the creamy dressing on top and toss to combine well. Taste for seasoning and add more if needed. Place in the fridge for 2-3 hours to chill. Give it a good stir and sprinkle with paprika, fresh cracked pepper, and more fresh dill. 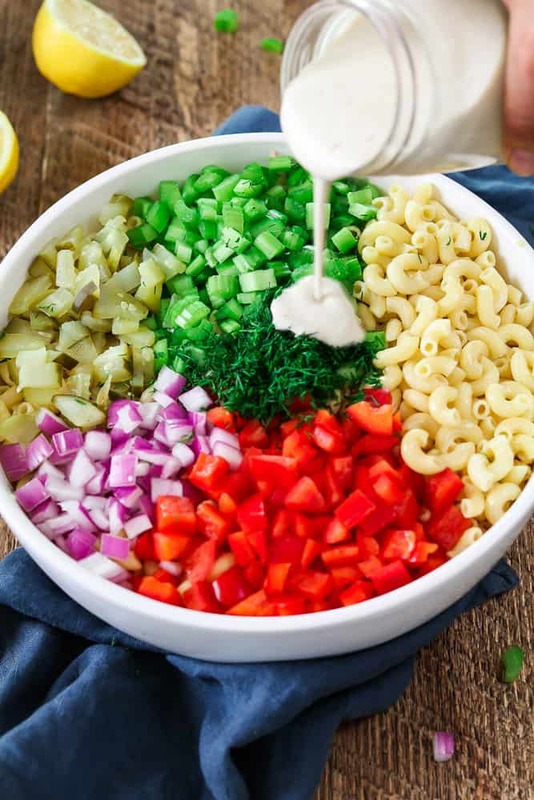 If you make this Vegan Macaroni Salad, let me know what you think by ★ star rating it and leaving a comment below. It would really make my day. You can also follow me on Instagram and share your creation with me. Just tag me @veganhuggs and hashtag #veganhuggs so I don’t miss it. 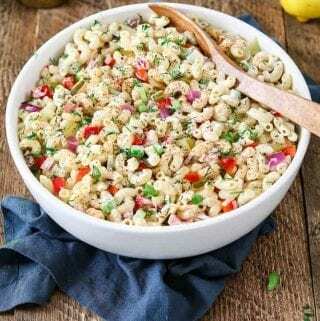 Creamy Vegan Macaroni Salad ~ a summertime essential! With a healthier twist, it's mayo-free but still rich, creamy & full of classic flavor. Put all ingredients in a high-powered blender and blend on high until creamy and smooth (*discard cashew soaking water). Adjust flavors as needed (* Keep in mind that the flavors will be concentrated, but it will be covering a lot of pasta). Set aside. Boil pasta in salted water and cook until al dente (according to package directions). Drain and rinse with cool water. When cooled, place in a large bowl. Drizzle and toss with olive oil (*omit to keep oil-free). Add all the chopped veggies, pickles and chopped dill to the same bowl with cooled macaroni. Now add the dressing on top and toss to combine well. Taste for seasoning and add more if needed (*the dressing will look thin and seem like a lot, but it will thicken up perfectly in the fridge). Place in the fridge for 2-3 hours to chill. Give it a good stir. Sprinkle top with paprika, fresh cracked pepper, and more fresh dill. Enjoy! What would you suggest for a cashew allergy? Thanks! Made it today and it’s about to be served. Beautiful salad! This macaroni s as lad recipe was spot on in taste and texture. 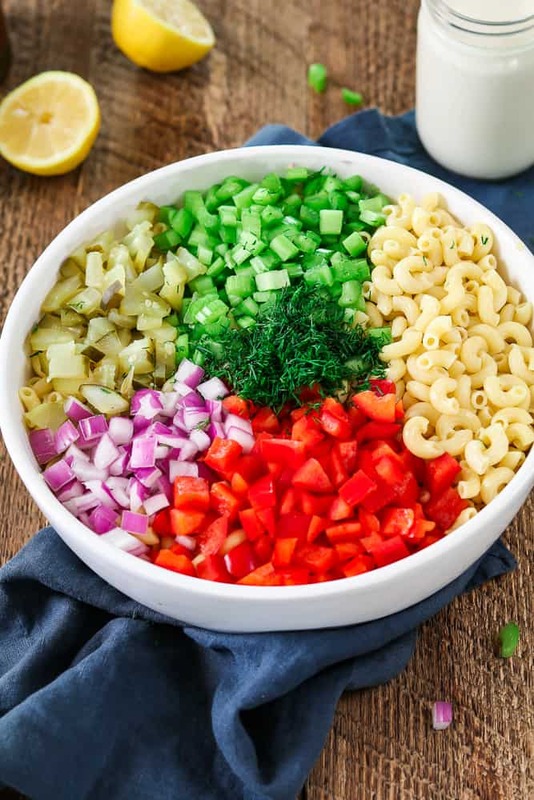 Thanks for the “WAY” healthier mac salad recipe! This looks amazing!! I cant wait to make it! !